Lots of stitching but unfortunately only one photo as the others on the camera have disappeared – very annoying but a stitching disaster would be worse! It always takes a big push to put the first stitching into a piece – all my own doing as I totally overthink it and the voice in my head (just admit it we all have one – some are noisier than other people’s) questions, queries and doubts my ability to draw and stitch. My first lot of stitching reflects those thoughts and looks timid and half hearted. I need to just go for it with bold stitching and see what happens. I’m not one of these people who can just stitch straight onto the fabric-I have to put the design onto the fabric first. This can be time consuming and tricky working out the best way of transferring the design without it leaving a mark afterwards. Finding Frixonball pens has made this so much easier. I draw straight onto the fabric, stitch and then iron the fabric and the pen marks just disappear 🙂 It’s the simple things in life which make us happy. I love the shape of the stems and middle of the crop but when I’ve stitched the outside of the crop the middle is totally lost, When you look at the photo in my last blog the centre of the crop head comes across to me as full and heavy. 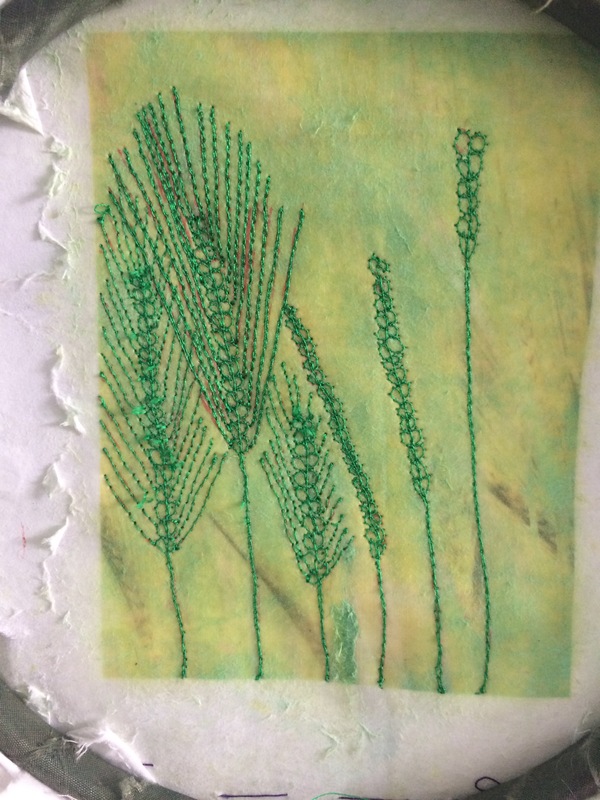 Next step is to fill the centre of the crop head with stitching to see what it looks like. Emotions have been up and down this week. Moving up to comprehensive school is a new experience for children and it’s brought back all my feelings from my experience of this. So I’m supporting my daughter whilst also dealing with my emotions. I went to a parents course on over-whelming emotions which has given me more tips and helped me to see the things I do which don’t help situations and the things I do which fulfill my mental needs and aren’t always right for my daughter. It also reinforced how important it is for parents to look after themselves – so I’m giving myself lots of TLC and doing the things that help my mental health.